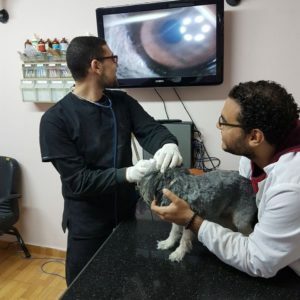 This state of the art American Veterinary Center was founded by Dr.Salah Hassan to be the first Veterinary Center in Egypt and the Middle East to offer the most advanced Veteinary Technology to your pet supported by 23 years practice experiance in the United States and great treatement in surgical skills. We understand that your pet is a very special member of your family. With this understanding, it is our desire to provide both you and your pet with the very best veterinary services. At American Veterinary Center , we are committed to bring the best Veterinary Medicine Technology to our community at affordable prices. From yearly vaccines to internal medicine, rest assured your pet will be treated as a valued family member.You are welcome to visit our clinic to see the proven state -of -the-art technology at any time. At American Veterinary Center we work hard to maintain an excellent staff of receptionists, technicians, and ward assistants . Our staff is a GREAT team, with the right mix of skills and background and has been carefully chosen to provide the best care for your pets. All, of course, have pets of their own. American Veterinary Center provides on premises instant diagnosis for your pet. We are the first and only clinic in Egypt and middle East to offer the digital Xray for pets. At American Veterinary Center , we’re always investigating new technological advances in veterinary medicine so that we can offer the most humane, efficient and comfortable methods of care. Less bleeding & decreased surgery time. Less swelling & tissue trauma. Less bleeding, swelling, and pain means quick recovery. We are proud to offer the revolutionary electro- surgery Technology to our patients. If you’re considering having your cat de-clawed, we offer electro-surgical de-clawing. This advanced procedure allows your pet to return home the same day, bandage free. American Veterinary Center X- Ray system is film-less, time-less and instantly transmits images wirelessly to the computer , then images stored on the computer can be managed, printed or e-mailed to clients.